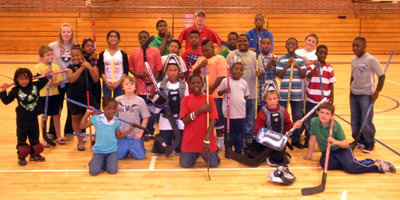 The Carolina Hurricanes Youth and Amateur Hockey team proudly donated hockey equipment to two Boys and Girls Clubs that joined our Canes Street Stormers initiative. The Washington Elementary Boys and Girls Club and Zebulon Boys and Girls Club were the first two program centers to receive equipment this year. 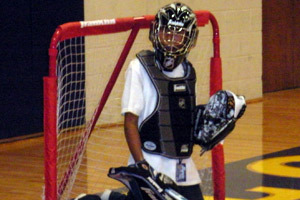 The kids were able to use the brand new equipment that day during an organized scrimmage run by the Canes' promotions and fan development staff. Along with the gear, the kids also received t-shirts, posters and bobbleheads for their efforts and enthusiasm. 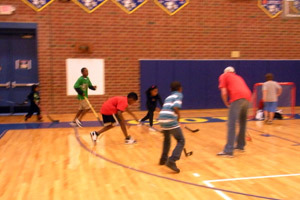 Street Stormers is part of NHL Street, an NHL league-wide street hockey program that provides schools and local community centers with an athletic and educational program free of charge. The NHL and the Carolina Hurricanes provide top-of-the-line Franklin street hockey equipment, including sticks, pucks, nets and protective goalie gear, so that all the participants need to participate is a pair of sneakers! In return, the center agrees to run the Street Stormers according to the rules and regulations set forth by the NHL and the Hurricanes and to actively incorporate this program into their curriculum. If you are an employee at a community center or after-school program and would like more information or would like to join the Canes Street Stormers program, please contact Kalee Stoever at kalees@carolinahurricanes.com.